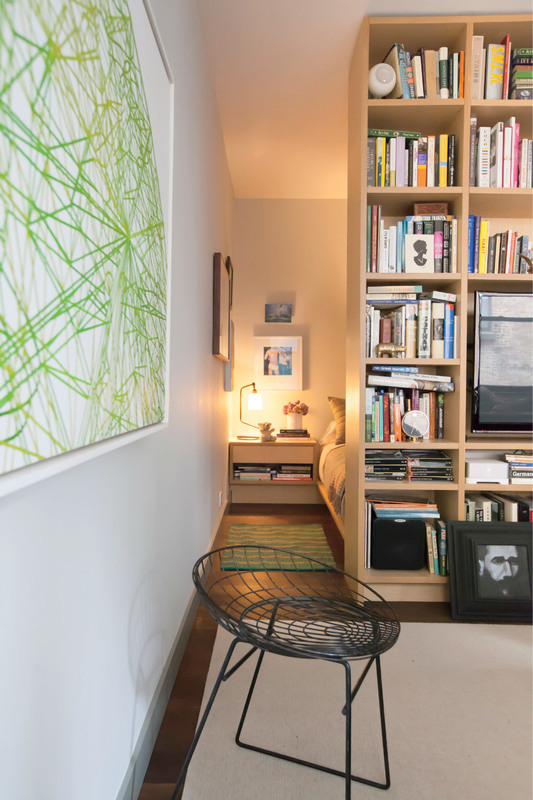 Custom built-ins were essential in defining and maximizing the 520-square-foot space. Greg Dufner designed the rift-cut white oak bookcase that separates the sleeping area from the rest of the studio. Dufner also designed the bed, which features storage panels under the mattress. The galley kitchen features space-saving appliances like an 18-inch-wide Miele dishwasher and 24-inch-wide Liebherr refrigerator; LED light strips are tucked beneath the cabinets. Along with a Dunbar sofa covered in Romo fabric, occasional seating includes a sheepskin Finn Juhl Pelican chair and a vintage wire chair. A BDDW coffee table sits atop a vintage rug. The artwork is by William Steiger. Dufner organized the studio by using furniture and rugs to divide it into zones for different functions. In the dining area, the floor is fumed oak—a technique that incorporates the use of ammonia to deepen the wood’s color and bring out the grain. A pair of Grass-Seated chairs by Nakashima Studio surround a Tulip table by Eero Saarinen for Knoll. 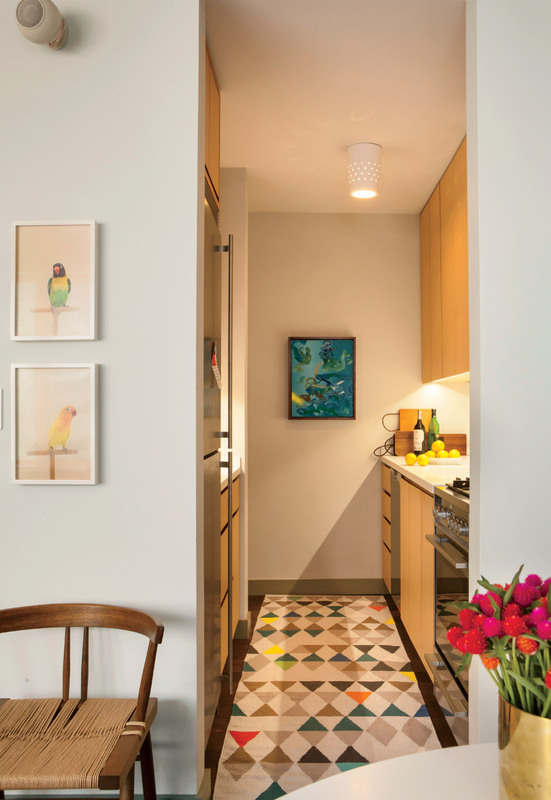 When you walk into the studio apartment of architectural designer Greg Dufner you’re greeted by an unusual feature: a foyer. An entryway like this might seem like a waste of precious inches when working with just 520 square feet, but as Dufner’s apartment proves, a small space doesn’t have to mean doing without. “I really wanted to create the spaces that we make for our clients, even if they’d be smaller and more intimate,” says Dufner, who, as a partner in the architecture and design firm Dufner Heighes, regularly works on luxurious residences more palatial than petite. With the new floor plan already sketched, Dufner’s first plan of attack was to give the apartment a sense of structure. When he bought the place, it was wide open, and almost entirely visible from the front door. By combining the formality of his larger projects with some small-space cues from boatbuilding, Dufner defined the entryway, added a built-in dresser, and made a dividing wall to cordon off the bed. Off the entry, the existing dressing room and bath were tucked behind the studio’s only doorway. In the kitchen, Dufner traded a bit of cabinetry to open up the space. The first step of the four-month renovation involved ripping up the floors, replacing them with dark fumed-oak boards with a matte Danish oil finish. Bright oak cabinets and a variety of rugs were chosen to balance the darker material. Next came the question of seating, the answer to which Dufner found in the modest scale of midcentury furniture, like the low-slung Dunbar sectional that works well with the apartment’s eight-foot ceilings. Additional pieces came from his work with Dufner Heighes, like the sheepskin-covered Finn Juhl Pelican chair pulled from the company’s storage trove and the contemporary Nakashima chairs Dufner ordered along with a commission. Other clever solutions, including cabinet-mounted outlets in the kitchen (so there’s none on the backsplash), LED light strips, and slim appliances from Liebherr and Miele, add functionality with a minimal footprint.